Who Owns Your Marketing Data? When the person/agency goes, the data is gone forever. Ouch! Ask yourself this: Does your internal business department OWN the accounts being used to collect digital marketing data, or are you relying on others to create and manage them for you? If the answer is no, read on to learn WHY you should own the accounts, as well as best practices on how to set them up. Let’s set the baseline for this article by defining what I mean by “data.” If your company is currently running pay-per-click ads for search engine marketing, then your company has either created the content, links, and cookies for the ads. OR you have paid a marketing agency to set up the content, links, and metrics for the ads. All of that comprises your data, and you own all of it. This means data does not ONLY refer to the numbers, but also the content of your marketing. In fact, data is considered anything that can be captured within a computing system. So the text in the ads is your data, not just the impressions and clicks. Images – The images created for the website are the property of the business that paid for the design of, or bought the rights to use, the images. Text – Any text created for the website is the property of the business that paid for said content. HTML/CSS/Java – Coding done specifically for the website is the property of the business that paid for the website to be built. Domain – This is complicated, but generally speaking domains are leased. Content Management Systems – Again, these are usually leased and therefore owned by the purveyor of said CMS. Ie, WordPress owns its CMS; businesses use the infrastructure for their owned content. If you’d like to learn more, here’s a great article I found that goes into more details. This concept can be applied directly to digital marketing – MailChimp owns the system, the business owns the content. Google Adwords/DCM owns the serving platform, the business owns the content. Taking it one step further, anything that is created FROM the content SHOULD be the property of the business. That is to say, if I own all the content on my website thedata.co, then I own all the resulting data. I own the number of visitors that came to my website; I own the number of times a button was clicked. With the absolute avalanche of digital marketing tactics over the past decade, agencies and business alike are scrambling to not just create the content, but learn how to track and store all the data it accrues. This often results in careless set up and limited access to both the accounts and the data. For example, it’s common for a business to pay an agency to build a website. The agency will often add a Google Analytics account as the tracking device for the website, but use their internal the agency Google Analytics account. This means the data collected from the website is the primary property of the agency, not the business. Another common occurrence is a business will set up their own Google Analytics, but use an employee email as the primary account owner. This can be very troublesome if that employee transitions away from the company. Set up a broad email account for the entire marketing department. This could be something like marketing@yourbusiness.com. Use this email address to set up all the digital marketing accounts and add access to employees as needed. This will ensure the data stays with the business and NOT with an employee. If you are working with an agency to create and run ad campaigns, give them access to this broad email. This is crucial, especially if you ever need to switch agencies, since your data will stay intact – just the access will change. Do your best to prompt the business to provide you with a broad email address as stated above. If they do not have one, try to make a generic gmail account for them, such as TheirBusinessMarketing@gmail.com. 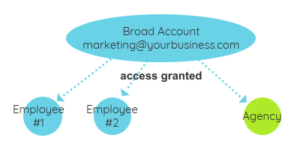 Agencies will also need a broad email account to obtain access to business accounts. 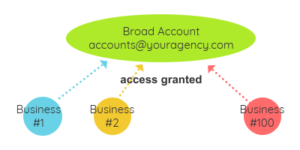 For example, Accounts@OurAgency.com can be granted access to a business Google Analytics, or MailChimp, or similar. Again, this helps alleviate any account transition, or employee transition, that is bound to happen. If all else fails, work with a professional that has enough experience to thoughtfully plan out marketing ad accounts so the data can be properly collected over the long term. And of course, we can help. The data that your marketing accounts collect belongs to the business that has paid for said content. If you do not have access to this data, or are looking to start collecting it for analytics purposes, reach out and we can help you get there.